Lucy Meeko, born in Kuujjuarapic, Quebec, is known for her diverse work in sculpture, drawing, engraving, basketry, sewing and wall hangings. Self-taught, Meeko creates work that shows realist portraits of women and children as well as domestic scenes. Although some of her pieces are abstract compositions, most of her engravings depict spiritual relationships between Inuits and animals. 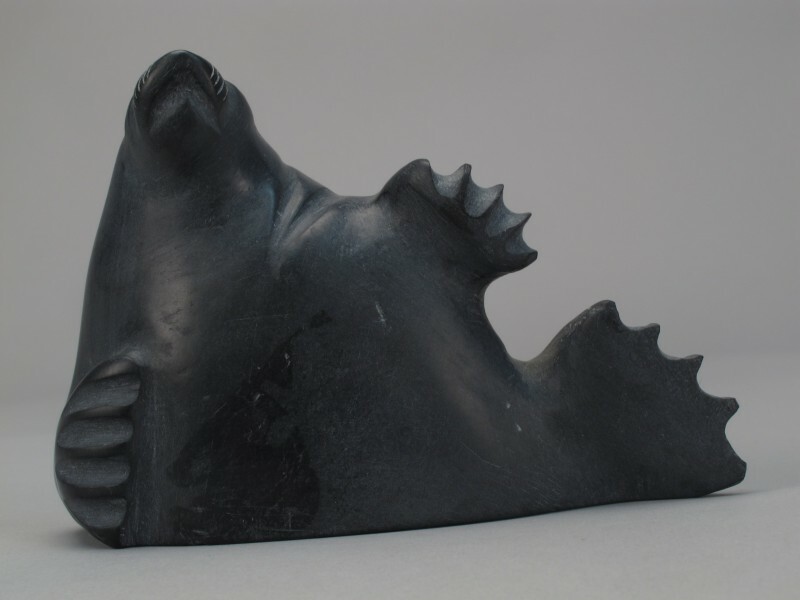 Meeko began sculpting in the 1950s, and she and her spouse, Noah, started making engravings for the Kuujjuarapic Cooperative in the 1970s. Two of her engravings were included in the Arctic Quebec Collection. In 1988, she was invited by the McCord Museum to demonstrate traditional sewing techniques. She earned an award at the ice sculpture competition in Rovaniemi, Finland for the “figurative expression” category. Finally, she appears alongside Nunavut artist Ovilu Tunnilie in the video Keeping Our Stories Alive: The Sculpture of Canada’s Inuit, produced by Indigenous and Norther Affairs Canada.